Macbeth is an established Italian Gothic Metal band in the international music scene. Founded in 1995 by drummer Fabrizio Cislaghi, the group debuts in 1997 releasing "Nocturnal Embrace ", a demo tape in a limited numbered copies. In 1998, Macbeth signs a recording contract with Dragonheart Records, a division of Audioglobe and the same year they release their first album "Romantic Tragedy 's Crescendo". The album has a good success and rave reviews throughout Europe and is regarded as one of the best symphonic gothic metal albums of the year. After a promotional tour and a few changes in the line-up, Macbeth enter the studio to record their second work, "Vanitas " which is released in 2001. The album shows a more aggressive approach without losing that trademark melodic side of the band. However a further leap is made with the publication of "Malae Artes " in 2005. The third album is recorded by a renewed line-up and is licensed in USA, Mexico, Russia and Far East, getting the wider release so far. The promotional tour takes the band from Europe to South America and in the major cities of Mexico. In 2006 Macbeth performs in Beirut, headlining the Rock Nation festival. Singer Morena guests in the musical project Rezophonic along with many artists of the Italian rock scene, and works as host in the Morning Glory and Database programs on Rock TV channel. In 2007 the band releases "Superangelic Hate Bringers" containing the single “Without You", and the promotional video reaches over 500.000 plays on YouTube. 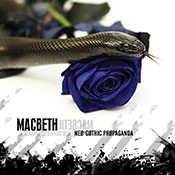 "Superangelic Hate Bringers " is the most direct of Macbeth’s album with a truly great production. The legendary British magazine Classic Rock publishes a rave review in the December of the same year, which raises interest around the band. In 2008, Macbeth reach England for the first time for a tour and return to Belgium for the sixth edition of the Metal Female Voices Fest. The same year the singer Morena participates as a guest at the March Metal Day Festival in Athens. The song "Do not Pretend " from " Superangelic Hate Bringers " is used by Sky Sports throughout the Formula 1 Grand Prix . While already at work on new album in 2009, the band was forced to take a long break due to personal problems but the long gestation allows the group to prepare a new album with superior qualities. "Neo - Gothic Propaganda " is now here and the band regards the album as the best work of his career. "Scent of winter" will be the first video from the album out. MACBETH are back! The Gothic Metal band from Milan finally release his brand new album "Neo - Gothic Propaganda", the most diverse and complete work ever made by the group. Although the new sound is more aggressive than ever, the new album will take you back to the roots of the musical style of the band too. Fans of the old albums will love it and new fans will find something special, new, fresh and a powerful production . The new sound combines a wide range of influences from classic Symphonic Gothic Metal to Scandinavian Death Metal with many contemporary, heavy, dynamic and very melodic elements. The dreamy interpretation of vocalist Morena and the energetic and eclectic voice of Andreas guide the tight rhythms played by Max, Shem and Fabrizio, creating new pearls marked as MACBETH. "Neo - Gothic Propaganda" is composed of ten new songs and shows gothic atmospheres that generate music that does not fit easily into precise categories. Just listen to "Empire 's fall" to understand how the band's sound has been pushed to a more extreme approach and beyond the clichés of Gothic Metal, and then enjoy the evocative " Scent of winter" and the classic " Void of light" through the oriental atmosphere of "Last night in Shanghai" . Following the evolution of the previous " Superangelic Hate Bringers ", " Neo - Gothic Propaganda" stands out as a symphony that goes beyond the boundaries of any genre, bringing a new musical life. "Neo - Gothic Propaganda" is a manifesto , a movement, it is the soundtrack of contemporary decadence ."